This post attempts to illustrate the difficulty of performing an event-time join between two time series with a stream processing framework. It also describes one solution based on Kafka Streams 0.11.0.0. An event-time join is an attempt to join two time series while taking into account the timestamps. More precisely, for each event from the first time series, it looks up the latest event from the other that occurred before it. This blog post is based on Kafka Stream although I found the original idea in this Flink tutorial, where the idea of event-time join is very well explained. Event-time join are often required in practise. For example, given a stream of transactions and another one of customer profile updates, we might want to associate each transaction to the corresponding customer profile as it was known at the moment of the transaction. Or given a stream of traffic information and another one of weather updates, we might want to associate each traffic event with the latest weather that was known for that location at that point in time. Note that an event-time join is not symmetric: performing an event-time join from stream 1 to stream 2 does not yield the same result as performing it from stream 2 to stream 1. If we were in a batch context, implementing an event-time join would be pretty straightforward. By batch context I mean one where "all the data is available", so that the execution of an aggregation like max(orderDate) is guaranteed to provide the last order date of the full dataset. One batch approach to linking each customer visit to their latest order that occured before that. A typical crux of stream processing though is the fact that datasets are unbounded and considered theoretically infinite. This implies that at any point in time, we cannot be sure that we have received all necessary information to compute the final version of anything. In the example above, this means that max(orderDate) only returns the latest order date observed so far, though that's an aggregation that's ever changing. This limitation applies also in the case of event-time join: any time we receive a transaction or a car traffic information, we cannot in general be sure that the information we current have concerning user profiles or weather time series is the latest that we will ever be available. We could decide to wait, though how long? This question of "how long to wait" is one key difference between stream and batch processing. In a batch approach, some data collection process is assumed to have "waited long enough" beforehand so that at the moment of the batch execution, we can consider that "all data is available". Said otherwise, "waiting long enough" is not a concern of the batch implementation whereas it is a first class citizen in stream processing. In many cases though, a nightly batch that processes the last day's data are nothing less than a manual implementation of a 24h tumbling window. Hiding the stream nature of a dataset behind nightly batches is sometimes hiding too much the complexity related to time by pretending that "all data is available". In many situations, we end up handling ourselves cases like late event arrivals or aggregations over more than one day (e.g. 30 sliding trends), which are much more natural if we use a framework that embrace the infinite time series nature of the dataset. Kafka Streams 0.11.0.0 does not offer out-of-the box event time join. It does provide however a couple of handy primitives for designing stream processing based on event time, as explained in the Kafka Streams concepts documentation. As far as I understand however, these features are primarily useful for time-based window aggregations and best effort flow control. Kafka Streams DSL also exposes KStreams-to-KTable join which essentially corresponds to looking up up-to-date reference data in real time. Confluent has published two excellent blogs about it (here and here). Combined with Kafka Streams's built-in best-effort flow control, this is already quite powerful and probably exactly what we need in many cases. As a point of comparaison, at the time of writing this, this feature is not (yet?) available as part of Spark Structured Streaming (2.2.0) out of the box. Ktable-to-KStream however corresponds to a lookup done at processing time (as mentioned in KStream::join javadoc). To fully support event-time-join of out of order streams, we need to manually keep some buffers of both streams, which is explained below. As mentioned in the introduction, this post is inspired from the Flink event-time join tutorial, and my solution is almost a copy-cat of their suggested solution. Note that the result of this is what I call a revision log, i.e. a stream that contains one or several successive revisions of a given information (here, the result of the join). From the point of view of a consumer, only the latest version should be considered for each key. This matches exactly what Kafka Streams calls a KTable. Note that this is all written with Kafka 0.11.0.0 in mind whose API is likely to change in the future. In particular, KIP-138 which is planned to be released as part of Kafka 1.0 will change slightly the semantics of punctuate, which I rely upon below. The processor API that allows a low level access to the events. The ability to create a stateful stream by creating a local though fault-tolerant state stores. These state stores are local, persistent (backed by a Kafka topic) and transparently re-created on any node in case of restart. In particular, window store are an awesome feature that greatly simplifies stream processing since they automatically clean up old data from the local buffer. Also, They allow us to store value associated to a key and a timestamp, like this: store.put(key, value, timestamp) and then retrieve all values for this key within a given time range, like this: store.fetch(key, fromTime, toTime). The API allow us to listen to several topics at once and even to listen to a topic name regexp ! This simple feature removes the need in this case of specific API for multiple inputs like Flink's CoProcessFunction. With all this explained and explored, the actual implementation is pretty straightforward. I pushed a proof of concept in Scala to my event-time-join-with-kafka-streams github repo. Each of these events are delivered potentially out of order with arbitrary delays. We want to perform an event-time join, i.e. 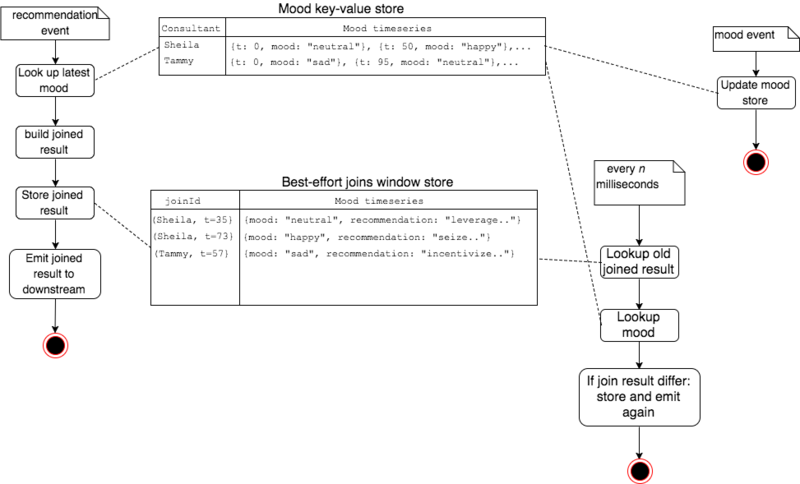 for each recommendation event, lookup the most recent known mood before the recommendation. This of course means that Kafka streams is very tightly coupled to the underlying Kafka cluster. This is a very different positioning than Flink or Spark Structured Streaming which are planned for various streamed input and output technologies. I like less the current java-only API which is very OO-based, encourages mutating objects and makes explicit use of null values. For example instances of Transformer (and several other API components) must be classes created with null instance members that are later on initialised in the init(). My preference would have been for relying more on immutable constructs. Likewise differences between scala and java generics semantics imply that scala code becomes less elegant than what it could be.